Scientists at Spain’s University of Jaen have found an affordable and eco-friendly way to make bricks from paper waste. The process diverts the byproducts of paper mills from going to a landfill, and the bricks can be created in less time than other building materials, saving energy and money. Waste material from paper mills, along with left over sludge from waste water purification processes, are mixed with clay, pressurized and extruded in one long piece of building material. The sausage-like piece is cut into bricks which are then fired in a kiln. 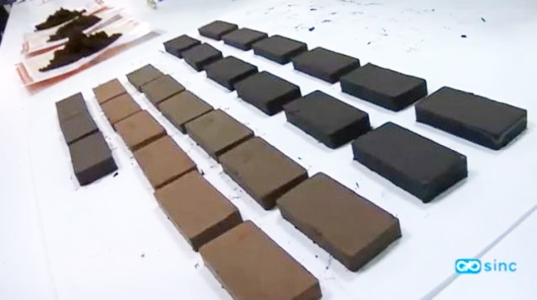 The process requires less time for the material to bake than the conventional bricks. The 3x1x6 cm paper bricks have low thermal conductivity, which gives them great insulating properties. However, bricks made from cellulose have considerably lower mechanical strength compared to traditional ones. Among other issues are adhesion problems and forming difficulties which accompany the manufacturing processes of materials with such high percentages of paper waste. The team continues to work to find balance between sustainability and strength of the material, in addition to investigating the advantages of incorporating other products, such as sewage sludge or waste generated by brewing, olive or producing biodiesel. Oh! This is interesting pretty cool! Thanks, I'm basing my innovation and emerging construction technologies project on this!